This is the tenth of a series of blog posts entitled “Diary of a Song“, where I share the stories behind each of the songs from my latest album “Illumination“. There really is no huge story behind this song and why I chose to arrange it for my album – other than the fact that I love the group OneRepublic and think that their music is utterly amazing. It is also very musical and classical in some respects. For example, when I listened to the cello part on their recording of “Secrets”, in my head I heard influences from the Bach Cello Suite in G. Hence the reason I decided to incorporate themes from the Suite into my rendition of “Secrets”. 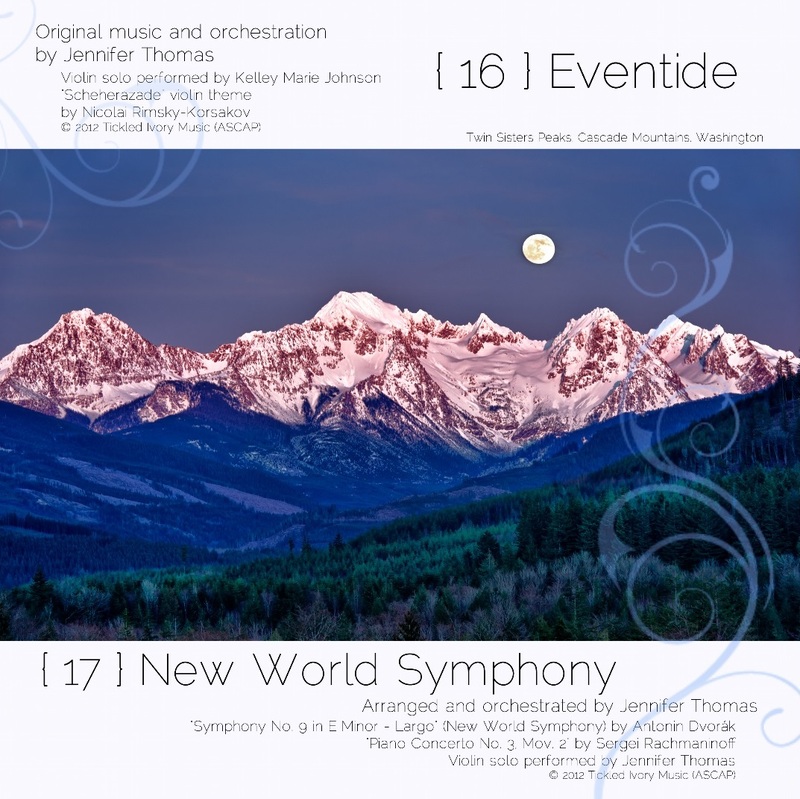 I will say though – that when I was writing this arrangement, I really felt strongly that I wanted this song to stand alone great as a SOLO PIANO work, and not just a great song with orchestration (as on the CD). I arranged the song with a very sweet, almost whimsical introduction to the song before it gets to the “meat” of it (where the cello comes in). I’ve heard many people tell me that it sounded very Danny Elfman-ish. Well, thank you. I take that as a great compliment because I like his work very much. Here is a behind-the-scenes look at the recording session for “Secrets”, featuring the young talented cellist Stephanie Yose. 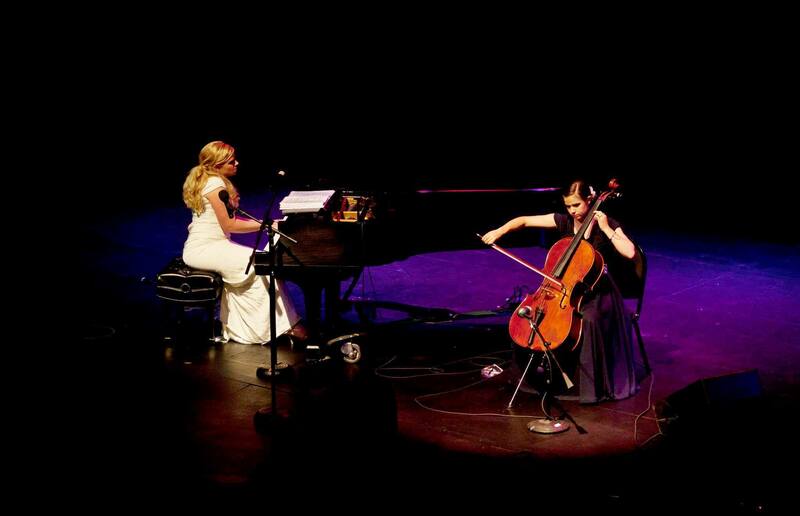 She was 16 years old at the time of this recording, and now she has gone on to play at BYU with a full ride cello scholarship. The talented Glen Gabriel did the beats and effects on the recording. All other piano and orchestration was yours truly. I’ve always thought it would be neat for Ryan Tedder of OneRepublic to hear my version of his song, but so far I’m not sure that has happened. During Grammy voting season I did come into contact with the founding member of the band. He had emailed me to talk about his latest album and we had some conversations over email – as we both had entries on the ballot last year. I asked him if he wouldn’t mind passing the song along to the band to hear. But as we all were caught up in the onslaught of Grammy madness, I never did hear back. I’m sure my song got lost in the mad rush and it possibly never got forwarded on. *sad face*. 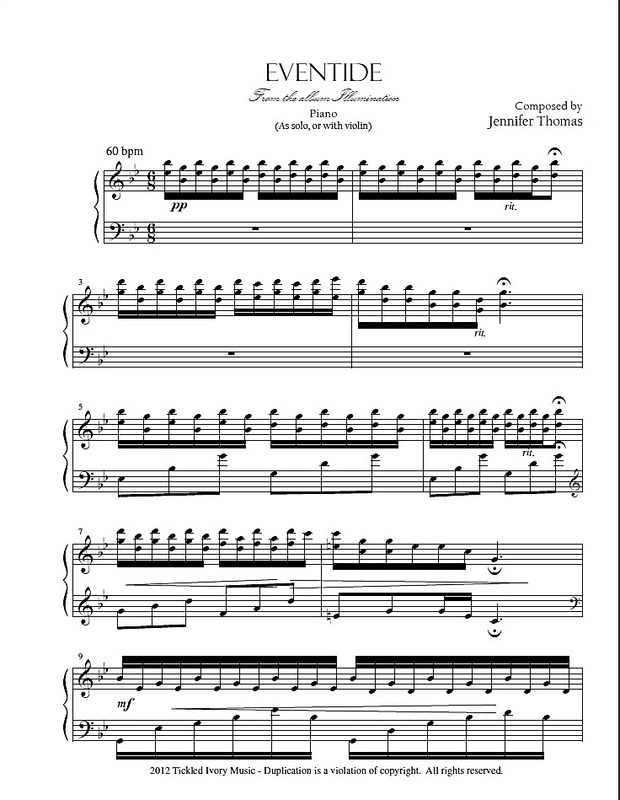 But as promised – I have sheet music for you guys! Better late than never right? It took me a while to get the publishing license from Hal Leonard via Sony Music Publishing. But I’ve got it now. I also had to transcribe the song a bit because my version that I play on stage is a cello + piano version and so there are chunks of the song where I sit there and have measures of rest while the cello plays. And so I had to go back and rewrite the solo piano version to fill in those measures. It’s finally all finished now and the sheet music is up on my website for only $3.95. 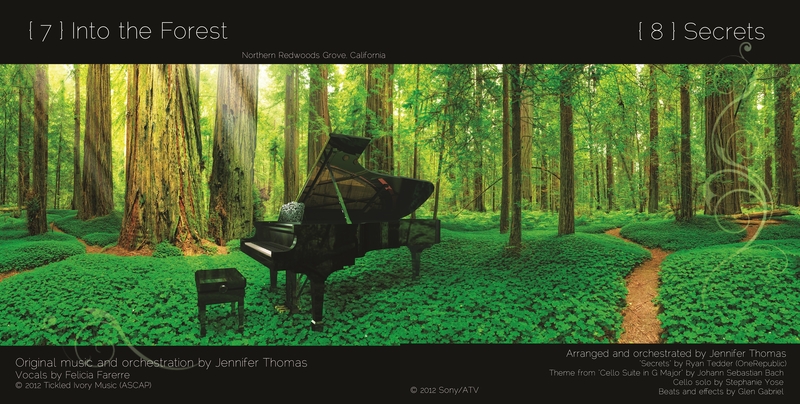 I hope you pianists enjoy it! It’s really one of my favorites to play. 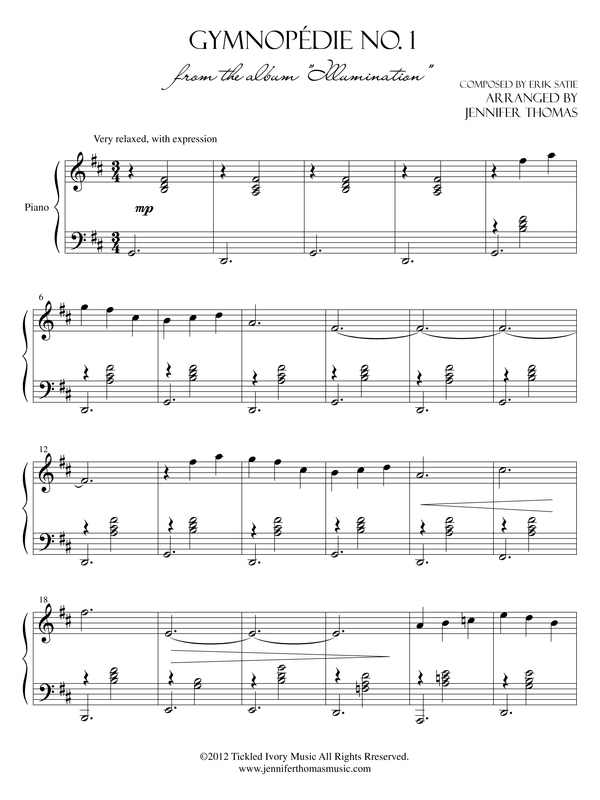 Link to Jennifer’s Store for the “Secrets” Sheet Music. 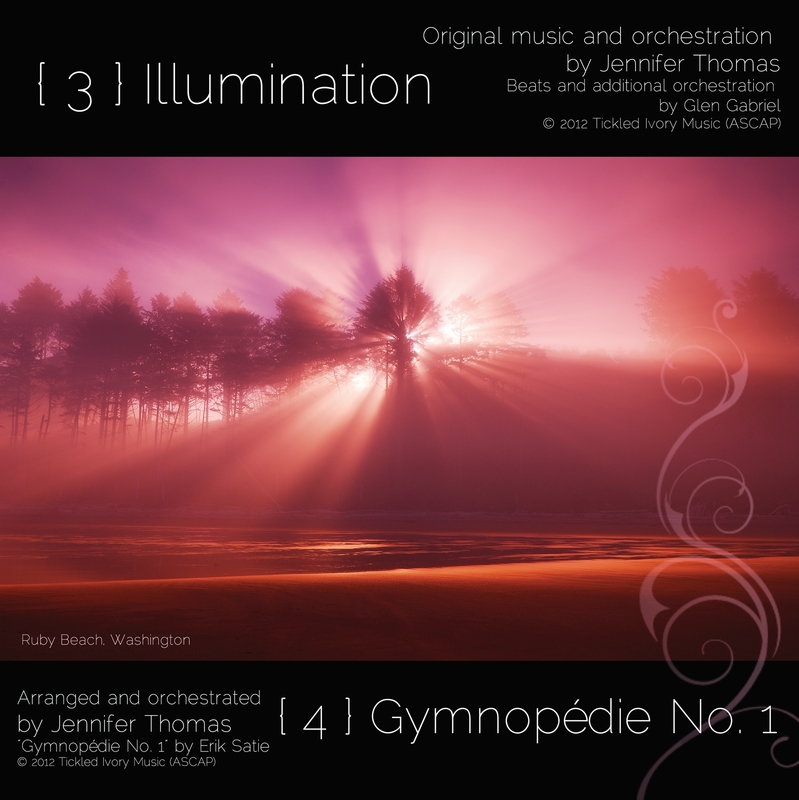 Buy the full Illumination MP3 album on Amazon, or the physical album with autograph from Jennifer’s Website. This is the seventh of a series of blog posts entitled “Diary of a Song“, where I share the stories behind each of the songs from my new album “Illumination“. Gymnopédie No. 1 is Track #4 on my new album, “Illumination”. Gymnopédie No. 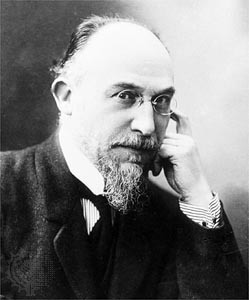 1 is the first of three songs (all named Gymnopédie) composed by French composer Erik Satie, who lived from 1866 – 1925 in Paris, France. He was sort of a revolutionary in his time – as he was breaking molds from the Classical form of music and taking a minimalist and repetitive approach. This song has been a favorite of mine for a very long time, and in my opinion is one of the “must-learns” on any pianist’s reportorial list. It is such a hauntingly beautiful, yet simple song. When I was a little girl I was a huge fan of the movie The Black Stallion. Not only did I love the movie but I also read the books, and often times found myself carried away into a dreamland of Arabia with horses races, romance, and suspense. I loved the scene on the beach when Alex (the boy stranded on the island with the wild stallion) finally befriends the horse and the horse allows him to ride him. The music in this scene, at sunset, carries a very strong resemblence to Gymnopédie No. 1, and perhaps that is why I have always loved this piece – because it reminded me so much of my favorite movie as a kid. You will see here in this video -if you skip to about 4:40 you will hear the music I talk of. There is something I really long for in this scene – perhaps it’s the isolation, the beach, being one with nature and no distractions. Whatever it is, it calls to me. As this song is such a peaceful song to me with meaning, I really wanted to include it on my album. Ignoring the dynamics that the editor from Schirmer’s had included in my copy of this song, I recorded this piece how I personally felt it. I added much more dynamic range to it, including some FF’s which are not in the original. I also took the 2nd half of the song and added more notes, making it more complex and driven. And finally, I added orchestration to it. Which, funny enough, I thought was so original in – but turns out Claude Debussy also orchestrated Satie’s Gymnopedie’s as well (except for full symphony, whereas mine still has the piano as the lead). I personally find my version much more dynamic and emotional. I can’t tell you what great care I took in recording this piece for my album. 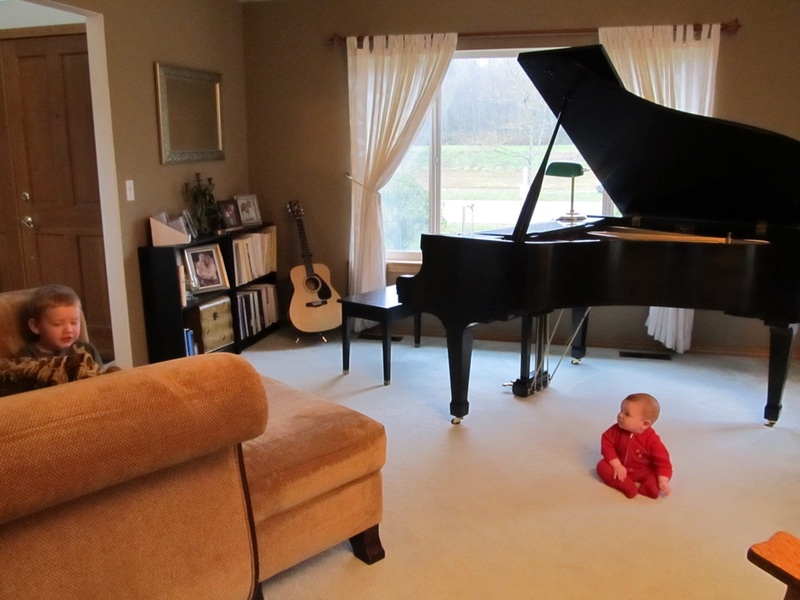 I was so OCD about it – every detail had to be perfect from the way I played the piano, the expression and dynamics, to every last note that the violins lifted off of the strings. You can purchase the sheet music (as well as other songs from Illumination) from my web store HERE. You can download the MP3 of this song HERE. This is the sixth of a series of blog posts entitled “Diary of a Song“, where I share the stories behind each of the songs from my new album “Illumination“. “Illumination” is track #3 and the title track on my new album. About two years ago, I saw an ad on one of the many TV/Film 3rd party company licensing websites where a European luxury car commercial was looking for music for a commercial. I don’t normally compose from scratch for opportunities like these (usually just submit already finished works), but the payout on this one was quite substantial and therefore I made an effort. Okay, it was VERY substantial. This one licensing opportunity would have paid me more than my music made in one year. AND the description of music that they were looking for basically almost perfectly described my style of music. I knew I had to try. I spent a lot time imagining a fast sleek car winding down a highway with curves. A BMW perhaps? Mercedez? Who knows. In my mind, I pictured a sort of Bond car, or luxury sedan. Aston Martin perhaps. I imagined the wheels turning and turning and the rhythm it created with its movements. Because I knew this has to be a 1 minute clip of music, my attack on the composition of this song was quite different than how I normally compose. I was crunched for time and needed to get to the main melody of the song from the get-go, so right after that short intro I immediately went to the theme of the music. Again….imagining a fast car zooming by. That was basically my entire composition for the car commercial, which I then added orchestra to. I wanted it to be simple, yet powerful. I proudly submitted the song by the deadline and waited to hear back. And finally, heard back. My song did NOT make the cut for the commercial and yes I was super sad. Especially because I spent a lot of time and effort on tailoring (what I thought) was the perfect song for this car commercial. So the funny part about this story, is several months later, I was online watching new movie trailers on Yahoo’s movie section. Before one of the movie trailers, a car ad came on. I immediately looked up and took notice, because the song sounded an awful LOT like my song “Illumination”. It was even weirder that my husband came in from the other room to find out what it was, because his response was also “Hey, isn’t that you?”. But it wasn’t me. But it was so incredibly close to my song that I almost thought it was mine. I was in such shock that I didn’t catch the name of the car. I thought I had seen Land Rover on the commercial, but I wasn’t certain. Will and I must have refreshed the browser a hundred times trying to find that commercial again, but it never popped up. We also searched YouTube and the Lexus/Landrover websites trying to find this commercial, and yet we could not find it. So annoying. So I just forgot about it. But as I was in LA last year and met with my sound engineer, Rob Beaton, who deals a lot with sound libraries and companies that scout music for commercial work – I told him about what had happened with my song and that car commercial. He told me that often times these ad agencies that scout music for commercials will find the music that they DO want, but they won’t want to pay the fee for it, so they will actually hire composers to write something very similar to it. BUT the story does not end badly. The GOOD news in all of this was that I still owned the rights to the song. It was mine to do whatever I wanted with. I let it sit for a long, long time until I finally came up with the inspiration to work on it again. It was kind of hard – as I had the first version really stuck in my head. But eventually I was able to go back to the drawing board, dissect it a bit, and start over. My album “Illumination” was actually originally going to be called “Portraits”, but as I kept working on it – the title Illumination just seemed more fitting for the vibrant cinematic music evolving for it. And as I was choosing photography to go with the song (as this was an art-based album with my Dad’s photography), I chose this photo as the perfect representation of Illumination. You can purchase that beautiful photo of Ruby Beach, Oregon Sunburst directly from my Dad at his website. As if the song hadn’t evolved enough, there was still more to come. 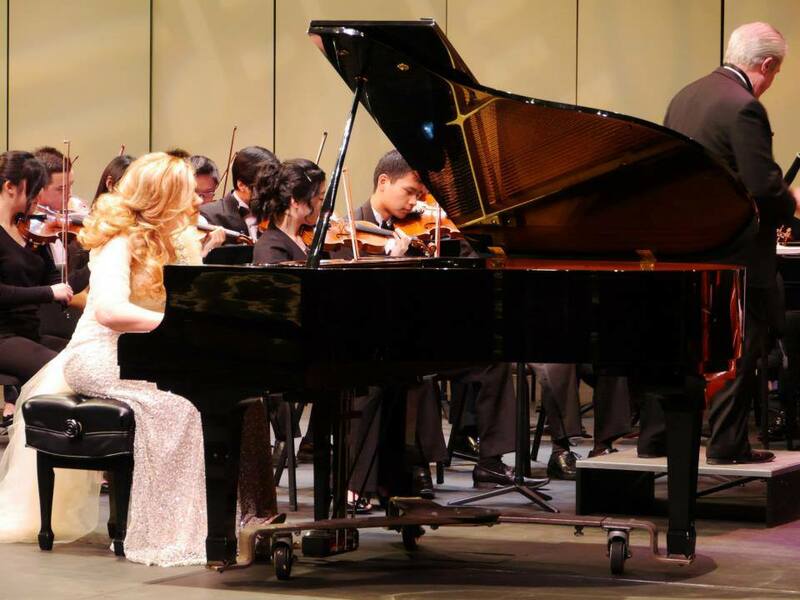 In the summer of 2012, I met with the conductor of the Evergreen Philharmonic Orchestra and arranged for me to perform with the orchestra in December of 2012. It was a lot of hard work to transcribe the song for a full live symphony orchestra, but it got done. I had the help of a couple transcriptionists (Travis Tagart, Daniel McBride). While I did a lot of the notation myself, I wasn’t familiar enough with the various clefs of brass and woodwind instruments and wanted to be sure I got it exactly right. I was so thankful for the help. I should also note, that as I said, I originally only wrote the song for Violins, French Horns, Percussion and then later added Celli as well. Transcribing it for a full symphony meant adding MANY more additional parts that were not in the original, and also dividing up the violin parts among the various string instruments. For example, in my recording, there are about EIGHT different violin sections playing various harmonies. But in a real orchestra, there are only TWO violin sections. So I transcribed some of the parts over to the violas, and then had each stand within the two sections playing different parts. Usually there are 2 violinists to one music stand and they play the same part, but instead I had them each split with different harmonies. The end result was obviously NOT the same as the recording, but still very fun and surreal to hear my music performed LIVE with an entire symphony! Here is the video if you care to watch. I made a few blips here and there, but overall it was a really great concert and experience. I’m still planning to shoot a music video for this song, but the plans for it have undergone many changes and I’m still waiting for the stars align for it to all work out how it’s supposed to. And now for the moment many of you have been waiting for, here is the link to BUY THE SHEET MUSIC for “Illumination”. I’ve noted in the music that there are a few measures where when I play it live, my part is minimal and the orchestra plays a lot. But for the solo piano version, I have done some “orchestra reductions” into the part. This is the fifth of a series of blog posts entitled “Diary of a Song“, where I share the stories behind each of the songs from my new album “Illumination“. This happens to be the only solo piano song on my new album. It was among the last of the songs I was recording and preparing for the album, and as I listened to it over and over to try to get orchestration ideas for it (as well as listening to it in a mix with other songs), I decided this song was better by itself and the naked piano. I wanted the listeners to create their own atmosphere for this song, and to feel like they were small beings amongst a huge universe. Keeping the song piano-only was one way I felt that could be accomplished. This song does not have any remarkable story behind it – other than I was just feeling very ponderous and melancholy while writing it. I did write this song while my piano was positioned right in front of a rather large window in my living room – which at night I could see the starry sky (hence the name of the song). I really enjoyed putting the major/minor transitions into the song. It is a song that I really enjoying playing, because it helps me to connect to my feelings and whatever I might be thinking about at the time. The photo that I chose to go with this song for the Cd booklet, is a picture my dad took of Mt. Rainier just before sunrise. The funny story about this picture, is that he must have taken at least a half dozen trips to Mt. 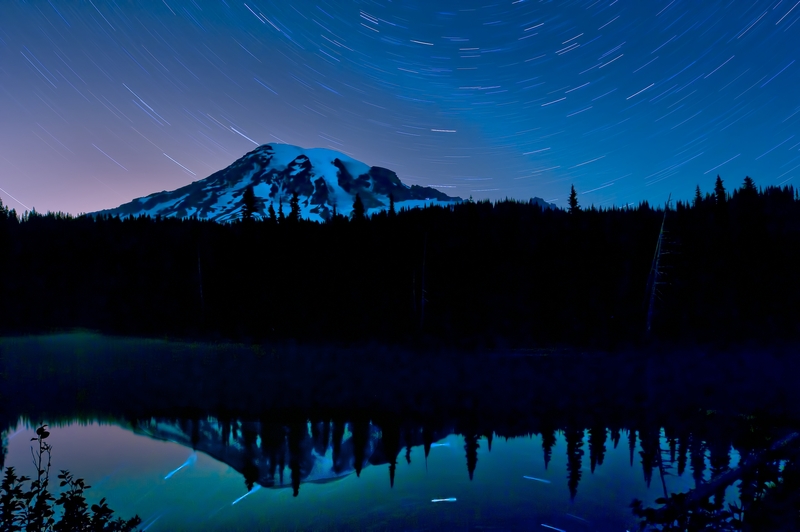 Rainier to get the perfect timelapse starry sky shot. I really loved this particular one, but he was not happy with it – saying that it was not up to a professional photographer’s standards. I won’t tell you all of the “flaws” he seemed to find in it, but I personally find it to be a beautiful photo and just perfect the way that it is. Upon staking out a spot next to the mountain to capture this photo, I believe my dad said he met a hiker who said he had been stalked by a cougar that night and so every little noise my dad would hear, he was very nervous about it being a mountain lion. This is the fourth of a series of blog posts entitled “Diary of a Song“, where I share the stories behind each of the songs from my new album “Illumination“. As most of you know, last night they announced the Grammy nominations. I was really hoping to see my name on the list of 5 nominees for Pop Instrumental, but alas I did not. I had worked very hard for the nomination for the past several months – lots of hours were spent on trying to secure this nomination, and I was told by many that I had a real shot at this. I know that having a Grammy nomination does not define who I am, and does not mean that I am any more or less talented. Sometimes these awards are very political as they are peer-voted. But as I tend to always try to have the best of faith in people, I had hoped that my album would simply wow everyone and they would just have to vote for it. 🙂 Even despite the tremendous support from my fellow Recording Academy friends, it didn’t happen, and yet I have received an outpouring of love in the past 24 hours from my fans who have told me over and over that I won in their books, and that my music has inspired them and that it means a great to them. Despite whatever accolades you may read in my bio, you also must know that I have had my share of trials and let-downs as well. For every award I have won, there are many more that I have been turned down for. For whatever film licensing or commercial work I’ve gotten, I have probably submitted my music to dozens more and not gotten a licensing deal. I have performed as soloists with symphonies, but have also had many many auditions where I flopped and was turned away. In the midst of all of this and the news of the Grammy NON-nomination, and with a promise I made earlier this week to release more new sheet music this week, it couldn’t be a more perfect moment to release AFTER THE STORM, track #2 on my album Illumination. I tell you this, because it is a very appropriate intro to the story behind After the Storm. On very special and rare occasions, I feel propelled by pure Divine inspiration to write a particular song. This happened with The Red Aspens, Eventide, Will’s Song, and yes, After the Storm. Composing does not come fast for me, but when Divine inspiration happens, the music usually always flows like an outpouring of love from my fingers to the keys. I just know how the song needs to be written. I don’t often write much about my religious beliefs, but most know that I do have them and am very close to my Savior and have a very strong belief in God. It is a central part of my life, and my family’s life. I owe everything to Him, especially my talents and abilities. And for some reason, even though I am not perfect and make oh-so-many mistakes in my day to day life, God still continues to bless me and watch out for me. Last year was not an easy year for me. Sometime I will tell you more about it, but for now I’ll just say it was not an easy year. Despite that, somehow I was able to write some very great songs out of that period in my life. It’s true, that out of hardships come some of the history’s greatest art. Not saying that my music is part of history’s greatest art, but for ME personally, some of my best music has come out of hard times (also great times too ). As I started composing After the Storm (which I had not named yet), I imagined myself walking on the beach with my Savior, talking to Him, and telling Him about some of the things I was struggling with. The ocean has always been a big part of my childhood and adult life, and brings a lot of inspiration for me. And as I wrote the song, I thought about the poem about the footprints in the sand….and how the poet talked about going through some of the darkest times in his life and feeling so alone, seeing his lonely footprints in the sand. Later God told him that it was not his footprints but God’s footprints and that He had carried the troubled man through his hardships. Anyway, one day, I saw a Facebook post from her where she mentioned having to go to the hospital. I was surprised, and asked her what was wrong and what had happened. She replied and told me that she had breast cancer, and she thought that I knew. Well, no, I did not know. I would have had no idea either, because she was always so positive and spunky and never complained about anything. Dixie also loves the ocean, and I also happen to know that she loved lighthouses as well. My dad (Ron Southworth, who took all the photos for Illumination), took this photo at Bandon Beach in Northern Oregon, at the Coquille Lighthouse right as a storm was passing over. I think the colors are amazing in this photo, and to me the lighthouse represents safety and hope after and through the storm. I named my song “After the Storm” and dedicated it to Dixie. I felt so amazed by her attitude through her struggles, as she made her way through her personal storms and conquered them. Even though I originally started writing this song by way of inspiration through a hard time in my life, I would say the majority of the song was written with Dixie in mind. This was was always FOR her. Shortly after releasing my album, I also received a very long email from a young woman who told me she had been going through a very difficult time in her life over the past couple of years, but after hearing “After the Storm” and “New Life” from my album, she felt hope for the first time. She told me that she listened to the song several times every single day and it gave her the energy and peace to make it through each day. I can’t tell you how much hearing something like that effects me and makes me feel so fulfilled. I am so happy to know that I was able to help someone else through my music. This song also helped heal me through a hard time this past August when I had surgery…but instead of writing about it, I uploaded a video of a house concert that I did in Salt Lake City in September – where I told the story to the audience and then performed it. Here is a photo from me at my CD release concert, just a few weeks after that surgery that I had. Also, here is a photo with Dixie, her husband, and I at the house concert in Salt Lake City. So, to say the least, this song has a special place in my heart. I’ve prepared the SHEET MUSIC for release, and feel that it is just as compelling as a piano solo (without the orchestration).